(Reuters) - Palladium soared to a record high on Friday as news that Russia is considering a temporary ban on the export of precious metals scrap fed into fears of a supply shortfall this year. Gold also bounced back above $1,300 an ounce as the dollar eased and global growth fears ramped up. Palladium jumped to an all-time high of $1,567.50 an ounce, and was last up 0.2 percent at $1,561.70 at 1258 GMT. Russia's trade and industry ministry said it is considering a ban on the export of precious metals scrap and tailings between May 1 and Oct. 31 to promote domestic refining of the materials. "It is just a speculation and some may use this as an excuse to push prices up. We have not seen details yet that palladium supplies from Russia will be curtailed," Commerzbank analyst Carsten Fritsch said. The price of the metal, used mainly in emissions-reducing catalysts for vehicles, has risen almost 90 percent from a trough in mid-August last year and is up about 24 percent so far this year. "The supply outlook remains tight... and that is providing enough confidence for the positive momentum to be maintained," Saxo Bank analyst Ole Hansen said, adding that the next key technical level from here is at $1,600 per ounce. Meanwhile, spot gold rose 0.5 percent to $1,302.21 per ounce, having shed 1 percent on Thursday. It held on track for a second consecutive weekly gain. U.S. gold futures rose 0.5 percent to $1,302. A loosening trend in global monetary policy is helping gold, SP Angel analyst Sergey Raevskiy said. As a non-interest bearing asset, it tends to suffer when rates are rising. The Bank of Japan on Friday cut its assessment on overseas economies, while comments from China's Premier suggested that the world's second biggest economy is facing downward pressure. In the United States, the number of Americans filing applications for unemployment benefits rose more than expected last week while new home sales fell more than forecast in January. "The U.S. economic news has been mixed and in response the Federal Reserve has been cautious on giving a clear outlook in its monetary policy, so for now it is a relatively healthy environment for gold," Raevskiy said. 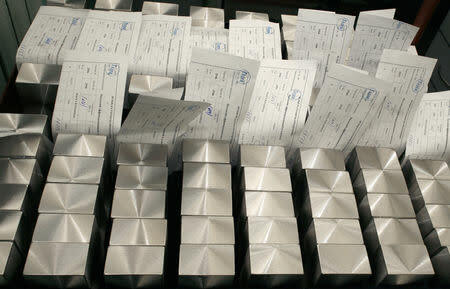 In other precious metals, silver gained 1 percent to $15.33 an ounce, and platinum jumped 1.4 percent to $830.15.